Hamilton are to upgrade their artificial pitch, with the Premiership club convinced the trend for synthetic surfaces will continue to grow. The New Douglas park pitch will be relaid to "Fifa's highest standards" as part of a £300,000 overhaul that will also see the floodlights improved. "The use of artificial surfaces is increasing steadily," read a statement. "We anticipate that within three years the majority of SPFL clubs will play on such pitches." The announcement follows two notable injuries in last weekend's 1-1 draw with Partick Thistle. 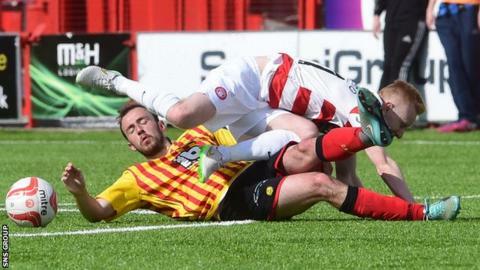 Accies defender Michael Devlin and Partick Thistle forward Ryan Stevenson were both carried off with knee injuries, the former suffering ligament damage and the latter needing surgery to repair a torn cartilage. Hamilton player-manager Martin Canning admitted the pitch would have been watered had the weather forecast not falsely predicted rain during the game but the club have defended the surface in the wake of criticism. "It is a condition of SPFL membership that artificial playing surfaces are regularly inspected by independent assessors of which we have had four such visits this season meeting every requirement," added the Accies statement. "The last such inspection was last Saturday prior to our game against Partick Thistle, when the inspection established that the playing surface is being maintained by our ground staff to the high standards laid down. "We are hopeful that the practice of pitch inspection, as required by all clubs with artificial pitches, will be extended to all surfaces in the coming season to ensure that all SPFL pitches meet the same requirements of this testing, which includes level surfaces and conformity of ball performance. "We are obviously committed to the use of artificial pitches within the SPFL, especially in light of the varied and extreme weather patterns we experience in Scotland."